Potent pre workout for explosive energy with added creatine nitrate! If you are looking for a pre workout supplement to help you smash each workout and crush your goals then look no further. 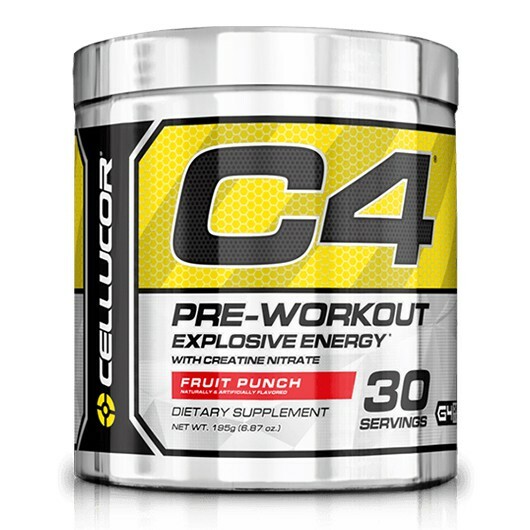 C4 is a powerful pre workout drink, each serving contains 1.6g of the finest beta alanine, 1g of creatine nitrate and 1g of arginine to support your workout. As well as vitamin c, niacin, vitamin b6 and b12 which contributes to normal homocysteine metabolism. The refined formula is now even more special than ever, thanks to the addition of TeaCor which improves energy quickly and lasts even longer! Be part of the next generation in supplements and become your own version of legendary with C4 pre-workout. Do NOT use in combination with other dietary supplements, pharmaceuticals or foods/drinks considered to be stimulants. Always read the Instructions and if in doubt consult your doctor before use. Blue Raspberry Beta Alanine, Creatine Nitrate, Arginine AKG, Vitamin C, Bitter Orange (Citrus Aurantium), Niacimide, Folate, Pyridoxal 5-Phosphate, Vitamin B12, Natural And Artificial Flavours, (Contains: E133), Citric Acid, Silicon Dioxide, Malic Acid, Sweetener: Sucralose, Acesulfame Potassium (Ace-K). Fruit Punch Beta Alanine, Creatine Nitrate, Arginine AKG, Vitamin C, Bitter Orange (Citrus Aurantium), Niacimide, Folate, Pyridoxal 5-Phosphate, Vitamin B12, Natural And Artificial Flavors, (Contains: E129), Citric Acid, Silicon Dioxide, Sucralose, Acesulfame Potassium (Ace-K). WARNING: THIS PRODUCT IS ONLY INTENDED TO BE CONSUMED BY HEALTHY ADULTS, 18 YEARS OF AGE OR OLDER. Do not use this product if you are pregnant, nursing, or are currently taking nitrates for chest pain or if you are taking medication used to treat erectile dysfunction such as PDE-5 inhibitors. Before using this product, consult a licensed, qualified, healthcare professional, including but not limited to, if: you are taking antidepressants such as MAOI (Monoamine Oxidase Inhibitor) or SSRI, blood thinners, nonsteroidal anti-inflammatory drugs, pseudoephedrine, or you are taking any other dietary supplement, prescription drug or over-the-counter medication; or if, you suspect you have or have been treated for, diagnosed with or have a family history of, any medical condition, including but not limited to: high or low blood pressure, diabetes, glaucoma, anxiety, cardiovascular, psychiatric or seizure disorders, cardiac arrhythmia, stroke, heart, liver, kidney or thyroid disease, or difficulty urinating due to prostate enlargement. This product contains caffeine and should not be used by individuals wishing to eliminate caffeine from their diet or in combination with caffeine or stimulants from other sources including but not limited to, coffee, tea, soda, or other dietary supplements and medications. Discontinue 2 weeks prior to surgery. Immediately discontinue use and contact a medical doctor if you experience any adverse reaction to this product. Do not exceed recommendations for Suggested Use. Use only as directed. Do not use if safety seal is broken or missing. Store in a cool dry place. 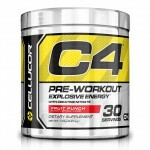 Take one serving (1 scoop) of Cellucor C4 mixed with 250-350ml of water 20-30 minutes before training. Once tolerance has been assessed and you are looking for an additional boost, take one additional serving (1 scoop) with serving taken before training. During your workout, it is recommended that your drink plenty of water or performance beverage. Some individuals may experience a harmless tingling sensation, which is attributed to beta alanine.